DON'T MISS OUT ON AWESOME SKIING AND RIDING TODAY. WE ARE OPEN FROM 8:30AM - 10PM TODAY. COME AROUND PARK HAS 8 FEATURES...4 RAILS, A ROLLER COASTER BOX PLUS 3 OTHER BOXES AND A WALL RIDE FOR YOUR SKIING AND RIDING. Wait until you see the new features in our Terrain Park! More rails, wider trails and more than a few cool surprises await you. Our Terrain Park Crew is busy in our fabrication shop to make sure you get plenty of fun and thrills this upcoming season. Once again improving on what is already the best snowmaking facility in the east; we�ve installed a 1,250 hp air compressor and increased our water supply to the mountain. This upcoming season you will also see exciting improvements to our Snow Sports Learning Centers. Our Valley School East has merged with Valley West so that we can now teach both skiing and riding at one location. The former Valley East School will be blended into Paradise, so we can conveniently load the Comet Quad Lift from both sides. Now Featuring 3 Exciting Disc Golf Courses! This advanced 18-hole course has got it all! Mountain top fairways, hill traversing woods play, and chances to launch a drive off the top of a mountain. Don't get a nose bleed! Spend your day playing in the shadow of the mountain. This 18-hole intermediate level course is half wide-open park like fairways and half forest. We even threw in some cool foot bridges and a hill top launching grand finale! Wanna catch a little disc golf while chillin' and grillin'? This beginner 9-hole jaunt is what you're looking for! This brand new course begins and ends at our Summit Lodge Slopeside Pub & Grill. Open in Summer and Fall Late May until Late October. Ski/Board Checks are located in the courtyards by Summit Lodge & Valley Lodge. We also provide ski & board locks outside our lodges which require quarters to operate. We provide areas for customers to secure their equipment, using their personal locks. Personal locks can be purchased in our Skiers Stores. Take a break from the thrills and spills of our exciting slopes and warm up in our Valley Lodge. Services include a Ticket Office with 8 ticket windows for faster service plus ticket kiosks. The Rental Shop has multiple points of service including rentals, tickets and lesson sales. The Rental Shop is a one stop location to get you onto the slopes quicker. The Rental Shop also has a Skiers Store to purchase goggles, gloves, hats & hand warmers. First time skiers or boarders will have an easier time getting started by using our Valley Rental Shop. Valley School East & Valley School West, with its triple chair lift and new conveyor lift, are conveniently located outside the Valley Lodge. Services also include a cafeteria and seating areas with a view of the slopes. An ATM machine and restroom facilities are conveniently located inside the lodge. Only a short distance away from the lodge you can hop onto our new Hi-Speed Detachable Six pack Chairlift or Comet Quad lift. The Summit Lodge, with its breathtaking view, is a full service lodge including the Ticket Office with conveniently located ticket windows, a Rental Shop, two Cafeterias with a fireplace, Club 223, a fully stocked Skiers Store, Babysitting Services and two ATM machines. The Summit Lodge is a great place to rest your weary bones and reconnect with your family and friends. Stop in and take a break "smoke free" atmosphere, similar to the Valley Lodge. For first time skiers and boarders, adults, or children ages 7 & up, Valley School West, with its triple chairlift, is the place to go. Get your rentals, lift tickets and lessons in the Valley Lodge and proceed to the school dispatch building. First time to advanced ski lessons are conducted at the Summit School Hill. Boarding lessons for all ages are taught at Valley School. Snowboarders and freestyle skiers can join our weekend program, Blue Mt. Freeriders. Choose from one day, a full weekend or a ten weekend package. The program is managed by USASA and AASI qualified coaches, teaching halfpipe, slopestyle, freeriding, and the best gate training in the Poconos. Our well known Explorer Program for kids ages 4-12 is located at the Summit Lodge. Full day or half day sessions are available. Our Explorer Hill is equipped with a Carpet Conveyer Lift. We have great terrain for all skiers and boarders, designed for the shredder in all of us!! 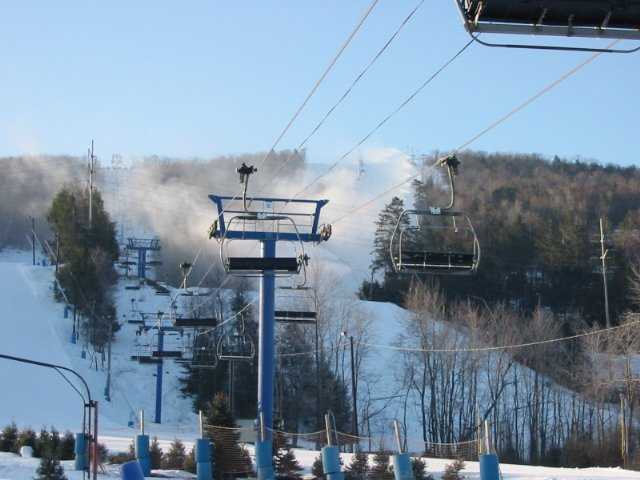 Terrain Run and Sidewinder Park combined make for one of the longest terrain parks in the Poconos and allow for skiers and riders of all levels to enjoy them. You can take your pick from over 4,000 shaped skis and over 1,000 snowboards. And yes, we are stocked with a large inventory of ski boards. Our staff prides itself in offering you the latest technology in skis and boards so that for novice to expert, we have the right equipment for you. Check us out in either our Summit Lodge or Valley Lodge locations. There is no reason for anyone not to enjoy some great midweek skiing or snowboarding when conditions are at their very best and lift lines are the shortest. You can leave your little ones with us as we offer babysitting for $2 per hour Mon thru Fri from 8:30 AM to 9 PM for kids ages 6 weeks to 5 years. Weekends and holidays are $4 per hour from 7:30 AM to 9 PM. Whether you are a beginner or an expert, you can look like a pro with all the brand name products available at our Skiers Store. You will find a wide assortment of ski and snowboard apparel ranging from gloves to complete outfits. There are accessories for the whole family that are stylish yet affordable, and are available all at one location. The quantity and quality at the Skiers Store is unsurpassed by any other ski area in the region, so stop by on your way to the slopes and check out the wide range of ski products and accessories. After a fun, long day of skiing or boarding, warm up with our Tavern-style food and drink specials in the friendly atmosphere of our Lounge. Club 223 is conveniently located in the Summit Lodge, so you can relax there whenever you need a break. With live entertainment featuring music from various local talents, your skiing or boarding adventure will end on a high note. Don�t miss any of the special promotions that will be happening in Club 223!